Ten years ago, on Saturday morning, 27 December 2008, it was a calm day in the Gaza Strip, where people were doing their work under a gruesome Israeli siege that had been going on for almost two years. 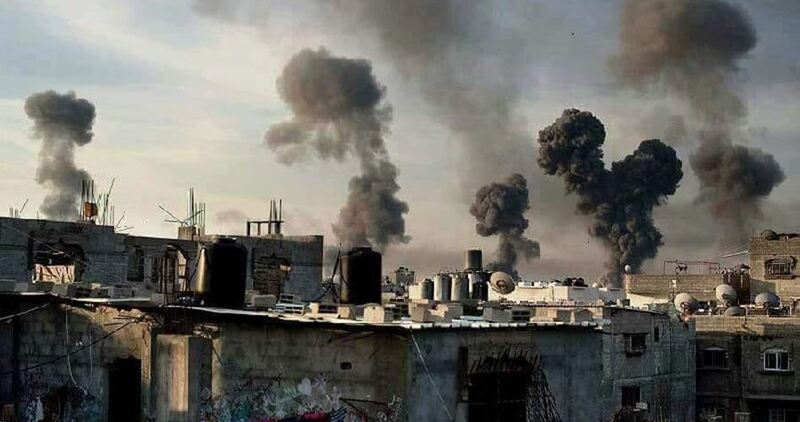 At 11:27 am, the Israeli occupation forces attacked the Gaza Strip when 80 Israeli warplanes poured their deadly missiles on dozens of civilian and security sites in the various areas of the Gaza Strip. During these strikes, more than 200 citizens were killed. Bodies were everywhere, dozens of martyrs arrived at the same time to the hospitals. The bodies of martyrs and wounded were mixed up, so that some of the wounded were transferred to the morgues unintentionally, following the horrors and confusion resulting from the situation. One cannot forget those scenes; it was a massacre by Israelis that was broadcasted to the world just as it happened, shocking everyone. The Israeli thirst for committing crimes didn’t stop at the first crime of collective air strikes all over Gaza, but also it continued during eight days of intensive and unprecedented shelling in various areas of the Gaza Strip, while the Palestinian resistance responded by shelling Israeli settlements and sites with various home-made projectiles. The Israeli warplanes targeted hundreds of houses, mosques and schools, reducing them to rubble. 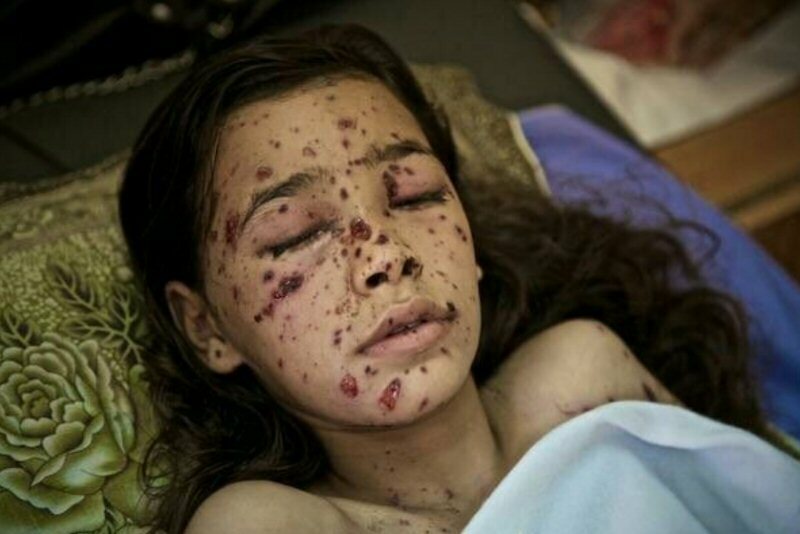 During the aggression, the Israeli occupation used a number of prohibited weapons such as white phosphorus. Israel has set a number of goals that it wants to achieve through its fierce war, the most important of which was the elimination of Hamas and the end of its rule in the Gaza Strip, the cessation of rocket fire and the return of the captured Israeli soldier Gilad Shalit to his family. On January 3, 2009, 8 days after the start of the aggression, the Israeli occupation forces began a ground operation. The occupation forces moved towards the outskirts of the Gaza Strip in an attempt to separate the Gaza Strip into several parts. This was not entirely successful because of the strong resistance on the various fronts. The attack continued for twenty-three days, during which the Palestinian people stood up and remained behind their resistance. They refused to surrender despite the massacres and the cruelty of Israeli occupation, which was ultimately defeated in spite of the huge gap in the balance of power. The occupation announced a unilateral cease-fire, followed by rockets fired by the Palestinian resistance during its withdrawal, just before the cease-fire came into effect. However, the first goal of the aggression was to stop the rocket fire. Despite the harshness of the Israeli attacks, Hamas remained in control of the Gaza Strip. The resistance kept holding the captive soldier Gilad Shalit with all goals of the aggression never materializing. The Gaza Strip healed its wounds and continued the process of building up arms until the Palestinian resistance reached a historic deal in 2011 which included the release of 1,047 prisoners in exchange for the captive Israeli soldier Gilad Shalit. Gaza was forced to fight again in 2012 after the assassination of the Chief of Staff of Palestinian resistance in Gaza, Ahmed al-Jaabari. The resistance factions challenged the pillars of the Israeli security by firing rockets at Tel Aviv. Only two years later, the occupation renewed its aggression in the summer of 2014, in which the resistance was attacked from the land, sea and air. The resistance factions challenged the image of the Israeli soldiers and their army in Nahal Oz, Abu Mutibak, Beit Hanoun, Zana and Zikim, as resistance rockets reached Jerusalem and Tel Aviv, and targeted Israeli sovereign institutions, such as the Ben-Gurion Airport, the largest airport in the occupation’s state. The resistance captured new Israeli soldiers who today represent a great hope for some 6,500 Palestinian prisoners in Israeli jails waiting for the moment to complete a new deal that will grant them their freedom. Al-Furqan battle, the Palestinian name for the 2008-9 aggression on Gaza, was a painful phase in the history of contemporary Palestine, but the Palestinian people turned it into a starting point for more strength and steadfastness in the face of the Israeli occupation. They have started since then a new and distinctive path to achieve their dreams of liberation and return. Rebecca Stead is an MA graduate of SOAS University of London, focused on Middle Eastern Studies with Arabic, with special attention to the history, culture and politics of Israel-Palestine, specifically, and the Levant, more broadly. offensive against the Palestinians in the Gaza Strip. The Strip had been placed under an Israeli-led siege a year earlier, subjecting the 265 square-kilometre-enclave to a land, air and sea blockade. Codenamed Operation Cast Lead, this offensive began at 11am on a Saturday morning, with Israeli Air Force jets firing on targets across the territory. Ynet reported at the time that “80 jets, warplanes and helicopters dropped over 100 bombs on dozens of targets [during] the initial strike.” Among the targets were the small fishing port and the main police compound in Gaza City. Throughout the first week of the assault, the Israeli occupation relied on aerial attacks to pound Gaza. A report by the Palestinian Centre for Human Rights for the week 24–31 December 2008 (cited in the United Nations Fact-Finding Mission on the Gaza Conflict [pdf], sometimes known as the Goldstone Report) found that Israel “launched at least 300 air and sea strikes against the Gaza Strip. Police stations in particular came under deliberate attack across the Strip. The “Arafat City” police headquarters in Gaza City, as well as three other stations, were attacked within the first few minutes of the assault on 27 December. The UN report states that, over the course of Israel’s military operations, 248 members of the Gaza civil police force were killed, which means that more than one out of every six fatalities was a police officer. Israeli Defence Minister at the time, Ehud Barak, claimed that there were three objectives for launching the offensive: “Dealing Hamas [which, since winning the 2006 Palestinian elections, had governed the Gaza Strip] a forceful blow; fundamentally changing the situation in Gaza and bringing the rocket attacks against Israeli citizens to a halt.” Barak ordered a “special situation on the home front” for all Israeli communities within a 13-mile radius of the nominal border of the coastal enclave, which was quickly expanded to include the southern Israeli cities of Ashdod and Ashkelon. the Israeli occupation also drafted around 6,700 army reservists, in case it decided to widen the operation. Given that the assault was launched during election season, all contenders halted their campaigns in a show of support for the then Israeli Prime Minister Ehud Olmert, who had also launched an offensive on Lebanon just two years earlier. On the eighth day of the offensive – 3 January 2009 — the Israeli occupation launched a ground invasion of Gaza. Israeli infantry entered the enclave from the north, supported by artillery fire and fighter jets. The Palestinians in Gaza, it must be remembered, have no artillery or other heavy weapons, no tanks, no air force and no navy. They faced the full might of one of the world’s strongest and best equipped armed forces with AK47s. In the later stages of the offensive, reports began to surface claiming that the Israeli occupation had used white phosphorous — a chemical which creates a smokescreen for offensives but which causes severe burns and organ failure — during its attack on the people of Gaza. The Israeli occupation initially denied these reports, but investigations by several human rights organisations documented evidence to the contrary. A 2009 Amnesty International report [pdf] found that “Israeli forces made extensive use of white phosphorus, often launched from 155mm artillery shells, in residential areas, causing death and injuries to civilians.” Among the targets were the UN Relief and Works Agency (UNRWA) headquarters and Al-Quds Hospital in Gaza City; an UNRWA primary school in Beit Lahia, north of Jabalia and numerous residential areas. Human Rights Watch (HRW) agreed with Amnesty’s assessment, claiming that the manner in which Israel used the chemical could constitute a war crime. Both the Israeli occupation and Hamas declared the resolution invalid. The offensive continued for another 10 days, only coming to a close after a brutal 22 days. “The ferocity of the attack was unprecedented in the more than six-decade-old conflict between Israelis and the indigenous Palestinians,” the Institute for Middle East Understanding (IMEU) observed. Donald Macintyre, former Jerusalem bureau chief for the Independent, said in his book Gaza: Preparing for Dawn that following Operation Cast Lead, “It was impossible to ascribe ‘victory’ to either side.” He argued that the Israeli occupation’s “bellicose pre-war talk of ‘crushing’ or ‘removing’ Hamas” proved to be “little more” than talk, while Hamas leader Ismail Haniyeh’s claim of victory was “at least as hollow”. The figures speak for themselves: 700 businesses were damaged or destroyed, with direct losses totalling approximately $140 million; the agricultural sector suffered direct losses worth $170 million; and over 3,354 houses were completely destroyed, with a further 11,112 partially damaged, according to figures from the United Nations Development Programme (UNDP). A separate UN report [pdf] estimated the cost of Gaza’s losses and damage at $1.1 billion. In the years since, the Israeli siege of the Strip has prevented the reconstruction of infrastructure destroyed during its 2008 offensive. To add insult to injury, Gaza has also since been the target of two more offensives at the hands of the Israeli occupation: the 2012 offensive, dubbed Operation Pillar of Defence, and the 2014 offensive, dubbed Operation Protective Edge. Almost 4,000 Palestinians were killed during these three offensives. Today, 54 per cent of Gaza’s almost 2 million-strong population is unemployed, while 53 per cent live under the poverty line in what has been described as one of the worst humanitarian situations in the world. A decade later, the Israeli occupation continues to shirk responsibility for its actions. Earlier this month, an Israeli court ruled against Izzeldin Abuelaish, a Palestinian doctor who lost three of his daughters during an Israeli air strike on his home in Jabalia, in the north of the Strip. Abuelaish’s story was made famous after he discovered that his children — 13-year-old Bessan, 15-year-old Mayar and 20-year-old Aya – had been killed while he was speaking to an Israeli TV channel; his suffering was broadcast live across the country and later shared widely around the world. Despite Abuelaish’s grief and the international attention his story received, the court still ruled that Israel bore no responsibility for the girls’ deaths, instead calling it an “unfortunate side effect” of the offensive.